Please note: if you have a coupon code, you will enter that in your cart. 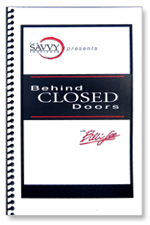 "Behind Closed Doors with Billi Lee" audio series and workbook! • Introduction to Savvy: why savvy is essential no. • The Bear Story: personal and impersonal system. Includes a link to download an accompanying workbook with highlights from the sessions and useful exercises. "Savvy, Thirty Days to a Different Perspective" by Billi Lee. Thirty succinct and witty chapters in this small book will challenge your perspective on the game of work and how to play it. Buy more than one! Our customers complain they can't get the book back when they loan it to other people.